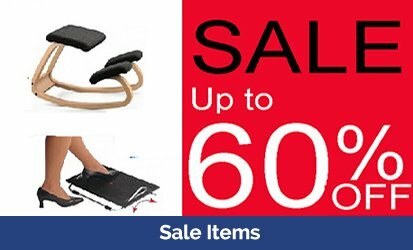 KOS Ergonomics are a team of ergonomic consultants who have being providing sit-stand solutions and sit-stand desks (standing desks) for over 17 years. 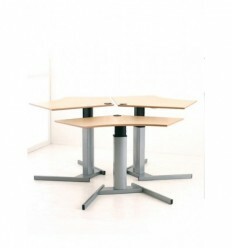 We are sit-stand experts and are very particular about what sit-stand desks we now take on. In those 17 years, we have seen Standing Desks being manufactured pretty much exclusively in Scandinavia with all manufacturers having a very high standard to now a huge number of Chinese imports with reduced and inconsistent quality and manufacturing standards. We have turned into a bit of a standing desk superstore over the years with the largest range of sit-stand solutions in Ireland. Have a quick read of our Sit-Stand Desk Buying Guide because we know exactly what to look for when buying a sit-stand desk. 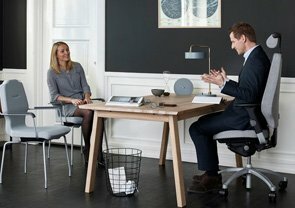 What is the best sit-stand desk? Sit-Stand Desk Build Quality - The best standing desk is one that's well made. At KOS Ergonomics we only provide sit-stand desks from Scandinavian manufacturers. Our most popular range of height adjustable desks Scandic-Desk is Danish made and Danish manufactured, so the build quality is exceptional. 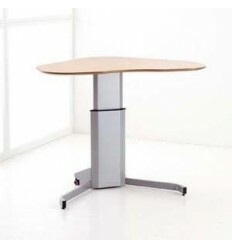 There is a lot of Chinese imported sit-stand desk manufacturers recently and the build quality seems to be very poor and the life time of the desk could be as short as a year or two. Where you would expect a 10-20 year+ life of a well made sit-stand desk. If you wouldn't buy a Chinese car, I wouldn't buy a Chinese Sit-Stand Desk. 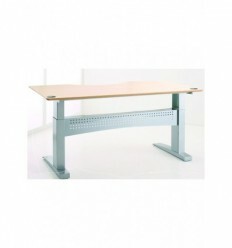 Sit-Stand Desk Height Range - The best sit-stand desk needs to have a large height range to suit the taller and smaller user in both the sitting and standing position. European Standards require a height range of at least 650mm-1250mm but our desks generally exceed this. 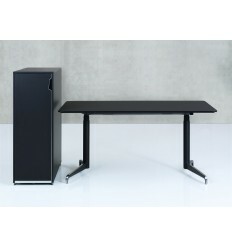 If a standing does not have this height range the desk will not go low enough for the shorter user while seated and the desk will not go high enough for the taller user while standing. 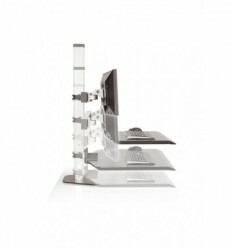 Sit Stand Desk - Ease of Adjustment - The best sit-stand desk needs to be easy to adjust, otherwise it won't be adjusted. 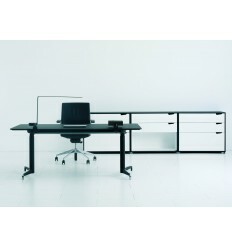 KOS Ergonomics are selling sit-stand desks for 17 years and have had all types of mechanisms. 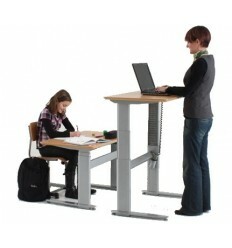 Electric Sit-Stand Desks - These are by far the best option as they are very quick easy to adjust. There is no manual handling risk and they can hold large weights. 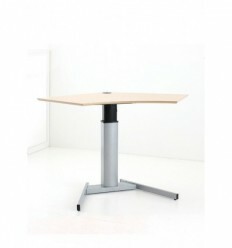 Crank adjustment sit-stand desks require the user to wind the desk up and down which becomes tiresome for the user and eventually usage reduces. They were very popular in the late 90's. Counter-balanced or gas assisted sit-stand desks are very quick and easy to adjust if they have the perfect amount of load on the desk. 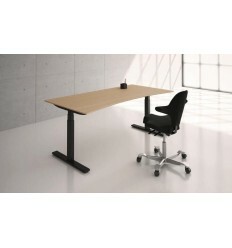 If there is too much load the desk begins to lose stability or the height may unintentionally drop. There may also be a manual handling risk when lifting the sit-stand desk, if there is too much weight on it If there is not enough weight or the resistance is set to stiff, the sit-stand desk can shoot up too quickly and can be very difficult to push downwards, particularly when raised above elbow height. 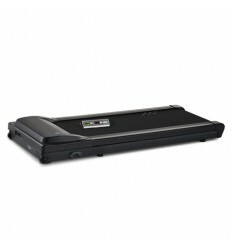 This makes it very difficult to adjust, particularly for the shorter user and there is a risk of injury while doing so. 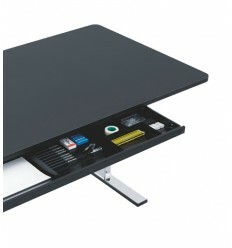 Counter-balanced mechanisms are generally only recommended if there is no access to electricity and the loads put on the desks are consistent. 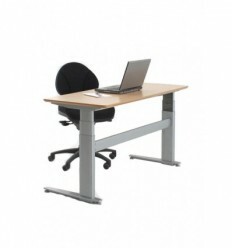 Sit Stand Desk - Dynamic Load capacity - For a two-legged frame, it is always recommended to have a load capacity of at least 100kg+. KOS Ergonomics always try to have sit-stand desks with a dynamic load capacity of at least 130kg because people will treat the sit-stand desk the exact same way they will treat a standard fixed desk. They will lean and sit on it. 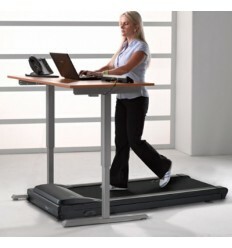 Also there is likely to be a significant amount of weight on the sit-stand desk. 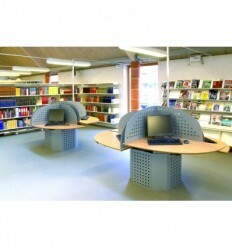 For light use areas or where space is tight, a single leg sit-stand desk may be suitable. A load capacity of 70kg would be suitable but with a word of warning. Sit Stand Desk - Energy Usage - Electrically Height Adjustable Sit-Stand desks use electricity but how much they use varies significantly. 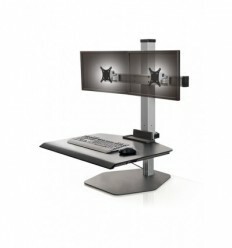 Our Scandic-Desk range uses on average 1/3 of the electricity on stand-by compared to the average sit-stand desk. Sit-Stand Desk - Anti-Collision - If you're looking for the best standing desk, I think anti-collision sensors needs to be included. When they come into firm contact with an object, the desk height reverses in height in order not to crush or damage furniture or a person. I think it's a must, if we really are talking about the "best" sit-stand desk! Sit Stand Desk - Cable Management - There's nothing that annoys me more then untidy cables and there all more visible when the desk can adjusted in height up to standing level. Effective Cable Management is a must, so always get a cable tray and cable sock with your sit-stand desk! 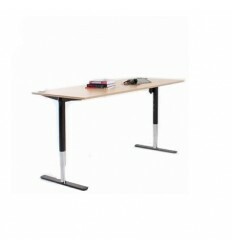 Sit Stand Desk - Stability - The best test of a sit-stand desk is to raise it to its very highest and see how stable it is. This is linked with build quality. 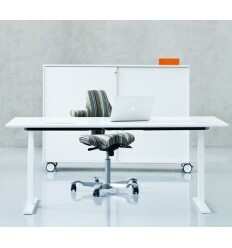 If the desk is unstable in the standing position it will be annoying and reduce the likelihood of usage. Also that instability means parts are moving that aren't meant to be moving, so this is going to increase the likelihood of a breakdown or failure significantly. If possible try out the sit-stand desk before buying to test the quality!